Nano is an accomplished Spanish Guitaris, performing an eclectic mix of guitar styles, but specialising in flamenco. Stunning audiences with his technical precision and soulful interpretation of the classical guitar repertoire, his emotional performances are always a highlight at any event. I started playing the guitar when I was eight years old. I come from a family of musicians/performers: my brother is also a guitarist, my sister is a flamenco dancer and my other sister plays the flute. I performed at my first concert when I was 13 at the Marbella Theatre and, since then, I haven´t stopped playing. 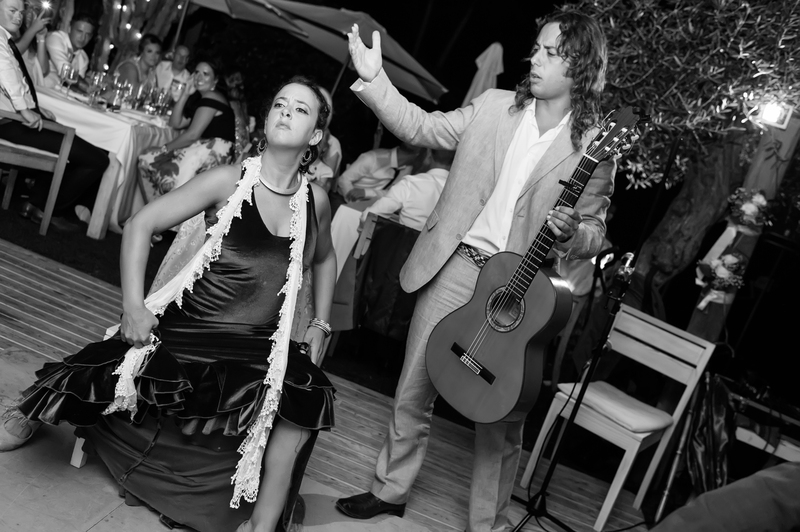 I am principally a flamenco guitarist and I play as a soloist or can also play while accompanied by a singer and/or dancer. 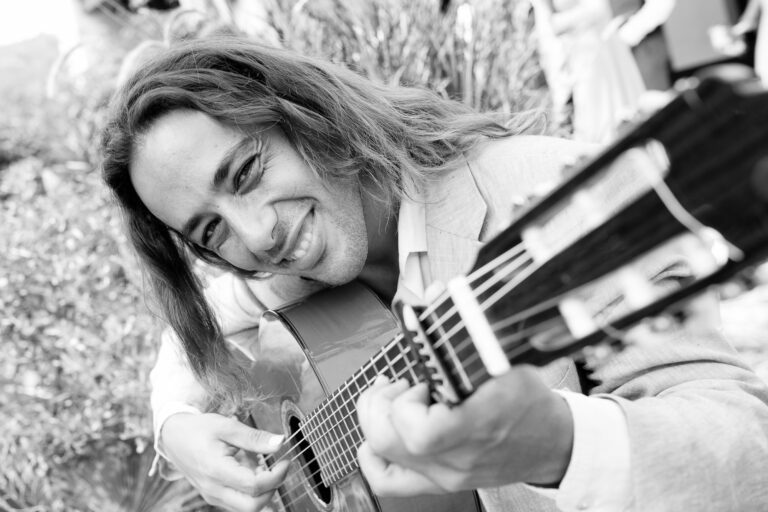 I studied with the best maestros in Andalucia and can play anything from pure classic authentic Flamenco through to more a more modern fusion style of guitar, incorporating other musical styles from around the world. My repertoire takes inspiration from those grand maestros like Paco de Lucia, Niño Ricardo, Manolo San Lucar, Tomatito, Pepe Habichuela but I also have my own compilations. The most important thing for me and my style of playing, is to play with love, respect and passion for the guitar and Andalusian culture. Flamenco is my life and I play with love and dedication to those who are listening. It is also important that I give my all to each performance and connect with my audience. When I started playing at weddings years ago I realised that by participating and paying attention to what was going on, my music could be the switch that created an incredible energy at the event. My music could help heighten an emotional atmosphere, make a moment more comical or romantic. Then I understood that my role was more than just a musician. I was becoming what we call in Spain a ‘Ceremony Master’. 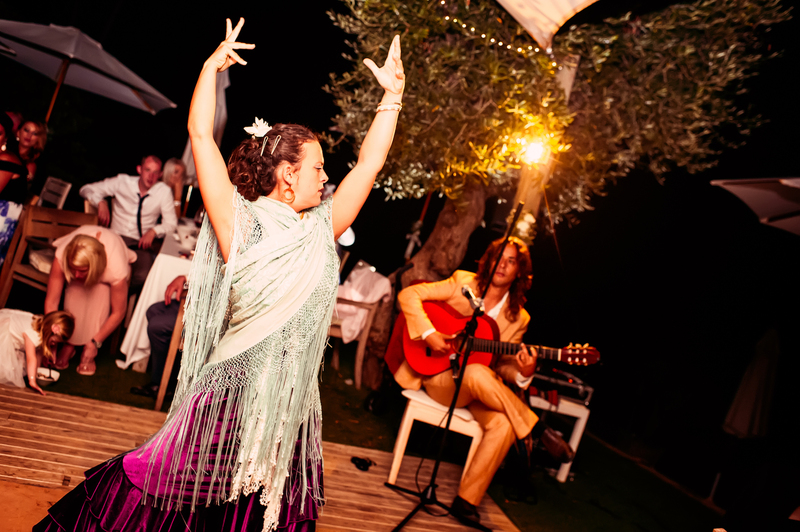 At a wedding or any special event, the Flamenco guitar offers incredible changes of intensity from sweet, slow and subtle playing to a more upbeat, stronger, fiery sound. The guitar can be played during the wedding to create that special atmosphere. I don’t think you can compare a DJ and pre-recorded music with the magic of a live musician. Your wedding day is the most important day of your life. For me, it is an honour to play at such a special moment, where family and friends come with open hearts and I know I must do my best. The energy at a wedding is incredible, and I’ve played at so many it´s now become my speciality. I don´t have a set selection for every wedding. Honestly, when I sit down I don´t know what I´m going to play. Firstly, I sit down in my chair. Next, I reassure myself that I will give the best possible performance that I can, then I look around and really see and feel what is going on and, depending on that, my guitar starts playing. Sometimes I feel the music should be more classical, sometimes more modern and sometimes it’s pure improvisation. I am led by what is inspiring me at that moment. It doesn´t matter if I play old or new music, the important thing is the connection with your surroundings and the positive vibes that you transmit. All weddings have emotional moments, but I recall one very original ceremony where the wedding party surprised the couple with a small speech by each guest, one by one, from their seats. It was very emotional and everyone cried a lot. The strangest song that I have been asked for was at an Iranian wedding. where they requested Iranian songs. There has also been a wedding where they requested songs from Walt Disney films like The Lion King. The most requested music at weddings is specific ceremony songs and music such as the Wedding March or Canon in D by Pachelbel. However, if you want to get everyone up dancing, then without a doubt it has to be my Flamenco style rumbas! Once I was asked to play the religious song ‘Give Me Hope’ but, by mistake, I started playing the Latin version by George Damm, which is a real party song. When the moment arrived for everyone to be relaxed and calm, I began with my rendition of this upbeat song. Nobody could stop laughing and I couldn’t understand why. I was a bit embarrassed, but the couple now fortunately remembers the moment fondly. The music that I am playing right now is the most motivating and creative that I have ever played. I am currently practicing for around eight hours a day. I am also focusing on my album which I want to reflect to the best of my ability and I expect it to be ready within the next year.